Fly with Top Gun F-14 Tomcats as you’re blasted off a modern day super aircraft carrier. Experience the F-16 Fighting Falcon and meet the pilots who made it a true multi-role fighter in the Gulf War. Ride along in the cockpit of the F-15 Eagle during gut-wrenching dogfights and supersonic low-level attacks. Patrol the skies over Iraq in an F/A-18 Hornet as pilots destroy real Iraqi MiGs. Total runtime approx 280 min. 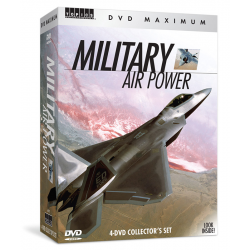 The flight action never stops in Military Air Power, a collection of military aircraft videos. Wings of Silver offers up the highs and the "lows" of United States Air Force prowess, on low-level strikes and at heights of 30,000 feet. Wings of Gold showcases high-speed aircraft carrier flight operations and a thrilling demonstration from the Blue Angels. Fly along in the world's most technologically advanced fighter aircraft as you battle an enemy MiG in Thunder from Above. Finally, Nightstalkers exposes the complete story of the U.S. government's military Stealth aircraft program. It's altitude with attitude on DVD. It takes practice to sound like a seasoned pilot! Talking on the radio can be intimidating and stressful. 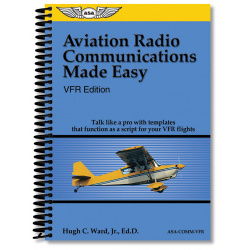 Aviation Radio Communications Made Easy will assist you in learning to talk effectively and efficiently on the radio during your flights. Take this communication resource with you on your next flight, to be used as a memory aid, training tool, and confidence builder to develop your communication skills. Soon, your delivery will be smooth and professional and you will fully understand what ATC is telling/asking you. The templates allow you to construct a communication script for every flight — regardless of its complexity or the number of communications required. Fill in most of the template blanks during preflight, tear them out and take them with you to the cockpit. Sized to fit your kneeboard, they work as speaking notes to lighten your in-flight workload and eliminate the guesswork about when, for what, and to whom you should be speaking. Multiple copies of each template are included, along with instructions, communication tips and practical examples. Each of the 32 templates (4 copies of each template) matches a different type of radio communication that may be needed in a VFR flight. Take along the templates necessary for the flight, and in effect you create a "communications trip kit" to use during the flight. 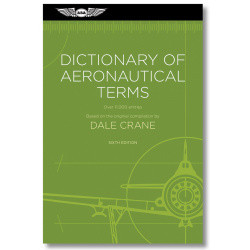 This book is especially effective for student pilots, ground schools, limited English-speaking pilots, flight instructors, and pilots transitioning to new airspace. Author: Hugh C. Ward, Jr., Ed.D. Single-source manual of what pilots should know about basic aircraft systems. Previously published by Jeppesen. Previously published by Jeppesen, Aircraft Systems for Pilots is a single-source manual of what pilots should know about basic aircraft systems. It includes a study of the fundamentals of physical matter (from which airplanes are made) and mechanics (how airplane parts act and react). Study of each type of system allows the professional pilot to stay abreast of the critical learning that must occur upon advancement into management of more complex aircraft. Subjects covered include physics, aircraft engine types and construction, reciprocating engine theory, engine lubrication and cooling, propellers and governors, fuels and fuel systems, power management, supercharging and turbocharging, pressurization and high altitude operations, electrical principles, aircraft electrical systems, hydraulic systems and landing gear, pneumatic and deicing systems, weight and balance, instrument systems, inspections, and much more. Study questions conclude each chapter, and the book is illustrated throughout, and indexed. 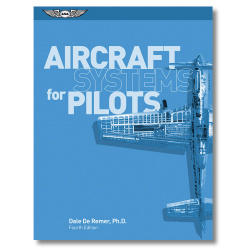 In print for more than 30 years and continually updated, this Fourth Edition continues to serve as the comprehensive college textbook for pilots learning aircraft systems. The Complete G1000 Course helps pilots transition from conventional "round dials" to the Technically Advanced Aircraft (TAA) glass cockpit environment. This 4-hour, narrated, computer-based tutorial will help you become proficient in operating the Garmin G1000 PFD, MFD, and audio panel from the safety and privacy of your computer without the expense of running up the Hobbs. This interactive software provides an orientation to the screens, knobs and buttons, to help you understand how to properly operate the system, interpret malfunctions, and achieve an effective scan. 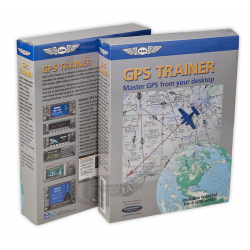 Applicable to both VFR and IFR operations and all aircraft installations of the G1000, and is PC and Mac compatible. Introduction to FITS and TAA; System Overview and Line Replaceable Units; Knob, Button, and Control Functions; Powering up the G1000; Primary Flight Display (PFD); Crew Alerting System; Transponder; Audio Panel; Engine Indicators and Management; Multi-Function Display (MFD); Flight Planning; Autopilot Integration; Instrument Procedures; Emergency Management. QuickTime 7 is available as a free download via the internet. Windows and Macintosh “Classic” compatible.